The enigmatic Peter Sagan and the workmanlike Greg Van Avermaet are destined to clash this spring. Will their rivalry finally turn to gold? IN ONE SENSE, Peter Sagan and Greg Van Avermaet are perfect rivals. They are built for the cobbled classics and tricky grand tour stages and are on the short list to win any world championship road race. They boast many of the same skills — the tenacity of a classics hardman, the sprint finish to close an epic day, and the sheer power to outpace the bunch on a punchy finale. And they are polar opposites in personality and character. Ever the showman, Sagan delights fans with wheelies and puzzling Yogi Berra-esque quips. The modest Van Avermaet is a model of type-A seriousness — he’s all business, all the time. Yet, in another sense, Sagan vs. Van Avermaet is hopelessly flawed. Thus far, neither man has appeared interested in fanning the flames of rivalry within cycling’s media. Because of its subdued nature, the matchup has yet to ascend to the realm of cycling’s best head-to-head battles. Sagan prefers to downplay any duel with Van Avermaet, often discussing it in enigmatic one-liners. “I can only do my race. He does his. The wheel turns,” Sagan said in 2016. Van Avermaet fields questions about the rivalry but has never rattled his saber on the matter. 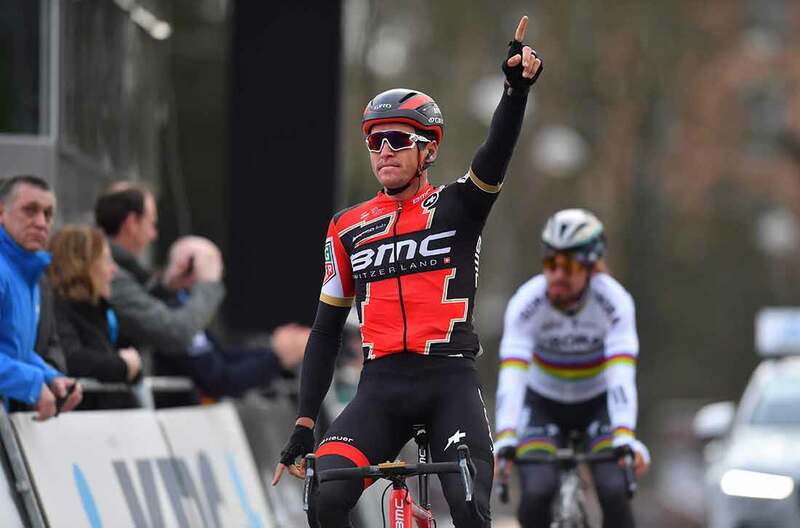 The closest he has come to promoting the duel came after his victory at the 2017 Omloop Het Nieuwsblad, which he won in a sprint ahead of Sagan. “I was the smartest rider, rather than the strongest,” Van Avermaet said coyly. So instead, fans have had to chart the rivalry on the road. Like all good competitions, there is a scorecard. Who is winning? It depends on your definition of victory. Both men own one monument victory: Sagan won the Tour of Flanders in 2016 and Van Avermaet grabbed the 2017 Paris-Roubaix. Sagan owns eight classics wins; Van Avermaet has seven. Van Avermaet is an Olympic gold medalist; Sagan is a three-time elite world champion and five-time green jersey winner at the Tour. On the 12 occasions when the two have finished one-two, Van Avermaet has the advantage, winning seven contests. In the 66 races where both of the riders have finished in the top 10, Sagan has the edge, beating Van Avermaet 70 percent of the time. As in any good rivalry, the result can depend on a plethora of factors, from the tactics to the parcours to the simple determination and will of the victor. Perhaps the most memorable clash came on stage 13 of the 2015 Tour de France. On paper, the long, straight drag to the line favored Sagan. Yet Van Avermaet gritted his teeth, and despite leading out the sprint, held Sagan at bay, seemingly by sheer determination. Will 2018 be the season that Sagan vs. Van Avermaet transforms into a generational rivalry? It’s definitely possible. Cycling is hungry for another thrilling battle to boost the cobbled classics into the stratosphere. Over the course of history, cycling’s one-day races have thrived on two-man battles. Eddy Merckx had Roger De Vlaemnick. Johan Museeuw had Peter Van Petegem. And, of course, Tom Boonen had Fabian Cancellara. The sport is just two years removed from Cancellara vs. Boonen. The Belgian press, specifically, would love a new battle to promote to hungry fans. Schotte has his doubts that Van Avermaet vs. Sagan will ever get to that level. “From a media standpoint, this rivalry in nonexistent, if you compare it to the big rivalries of the past,” Schotte says. 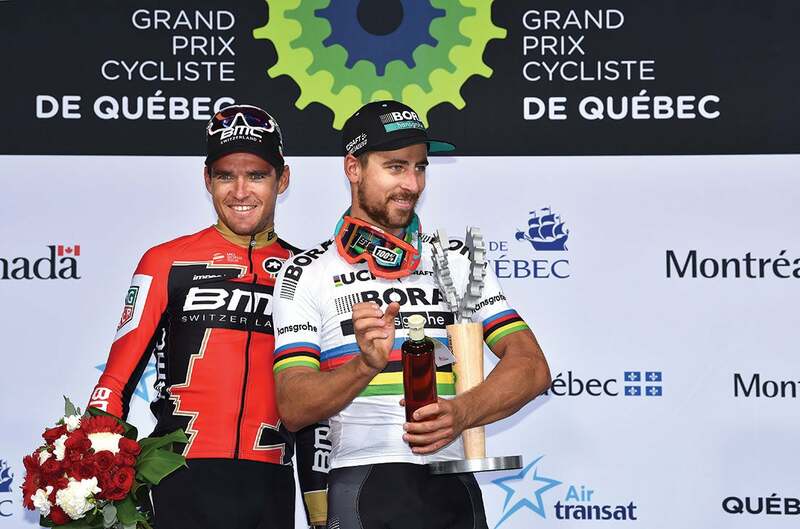 Van Avermaet and Sagan aren’t inclined to fan the flames of their rivalry in the press, despite their frequent battles on the road. Photo: ©Tim De Waele | Getty Images (File). Instead, the men are likely to build on their own individual stardom irrespective of each other. Van Avermaet, for example, has already become a superstar in his home country, due to his Olympic title and fantastic spring campaign in 2017. And Sagan’s individual fame needs no boost. Already a three-time world champion, Sagan has become one of cycling’s biggest ever stars, largely through his victories and personality. With their respective rainbow stripes and golden rings, the necessary ingredients are there to reimagine the next great rivalry in pro cycling. It’s now just up to the two players to play along. There will be plenty of opportunities: the pair are slated to meet at Strade Bianche, Tirreno-Adriatico, Milano-Sanremo, E3 Harelbeke, Gent-Wevelgem, Flanders, and Roubaix, all before mid-April. (Sagan will skip the Belgian classic opener at Omloop Het Nieuwsblad and Kuurne-Brussels-Kuurne, the latter of which he won in 2017. Why? He wants to win more monuments.) After that, expect more fireworks at the Tour.